FUSE will be making their debut appearance at the Amsterdam Dance Event, following on from a season of parties on the White Isle. The UK based imprint and event series will be throwing a party on Wednesday 15 October at the city’s Undercurrent, a glass warehouse situated behind the Central station. The event will see appearances from London and Ibiza residents Enzo Siragusa, Seb Zito, Rossko and Rich NxT. 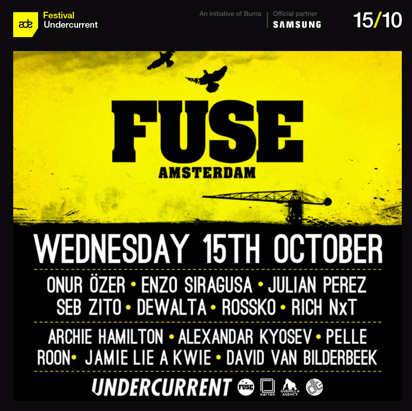 In addition there are three of FUSE’s most trusted guests in Onur Özer, Julian Perez, and De Walta. They will be joined by Amsterdam’s Karton imprint, who will be running the second room with a line-up including label founders Pelle and David van Bilderbeek, Moscow Records boss Archie Hamilton, and Karton favourites Alexandar Kyosev and Roon. Undercurrent is a large warehouse situated on the waterfront, appearing as if it’s floating on water, and features panoramic glass windows that aid an idyllic sunrise in the early hours.